Otis Education Consultancy Private Ltd.
Market Research on Training Practices in Manufacturing & IT sector companies. My internship project was on training practices in Manufacturing Industry. Training methodologies are playing very crucial role in today’s world of cut throat competition. Now a days each and every organization are focusing more on increasing operating efficiency because by doing so they will earn more profit margins. The skilled work force is pre- requisite for increasing operating efficiency. Big companies are paying more attention to their training activities as training is required to transform a workforce into skilled workforce. The purpose of my project was to find out the list of companies which are providing Microsoft excel training to their employees to improve their skills. I have to do market research on manufacturing sector companies. After this I have to generate a lead for my company as my company is providing training to Corporate and Management colleges. Otis Education Consultancy is an IIM Ahmedabad alumni venture started in 2012. This company is located in Gurgaon. This company was started by Mr. Aman Vig and Mr. Tarun Hathila. Mr. Aman and Mr. Tarun have done their graduation from Delhi College of engineering and IIT Roorkee respectively. 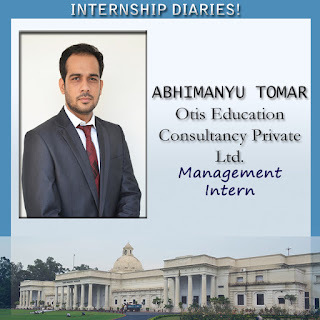 Mr. Aman has 4 years of work experience in SAP Labs. Both of them have completed their Post graduation from IIM Ahmedabad. This company has around 8 employees and 3 of them operate virtually from different parts of the country. This company provides various types of training to Corporate and Management colleges. It includes Excel training, SPSS training and training of other Business Automation tools. The major chunk of their revenue comes from excel training and also a meager portion of revenue comes from consulting service that they provide to corporate on the basis of Min.hour system. The list of their clients includes Capgemini, Apaar Industry, Aarti Industry, Punjab University, Meerut University and other management colleges of Ahmedabad.